I treated myself to a little time out at the Tricycle cafe, a little tucked away cafe in Salamanca Place, Hobart. I have actually intended to go there on a previous occasion but I literally couldn't find it on my first attempt. Above is the entrance near the Peacock theatre. The tricycle lets you know you are in the right place if you were like me and a bit lost. 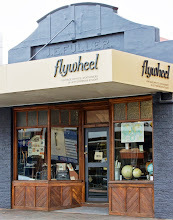 The interior is decorated with colourful vintage tricycles and Art deco mirrors add more interest. My chai tea come out in a wonderfully petite vintage enamel tea pot. We once had an enamel tea pot in our store of this size, but they are very rare. I felt right at home with the old worn silverplated tea strainer and spoon. And how cute is this little sugar bottle? Although most famous for the market that is held each Saturday, Salamanca Place is also home to many boutique shops offering unique pieces such as The Maker (above). This store had a lovely array of handmade jewellery in the window. Just half an hour spent poking about in this area made me realise you don't have to always travel to the other side of the world to be delighted with shops and cafes...sometimes the best places are right on our front doorsteps. I think I'm going to need to come to Hobart someday soon. Look what I'm missing out on!! 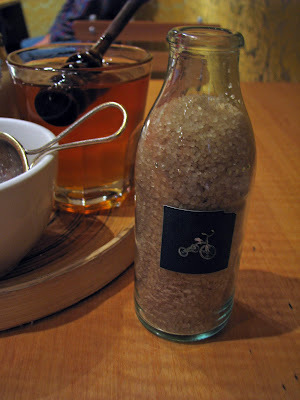 Love the idea of the sugar in the bottle. The jewellry sounds great, is it chunky jewellry or finer jewellry? Anyway, better go and start the day! Enjoy yours! Thanks for leaving a comment. I always appreciate it. Totally understand about not taking pictures of the jewellery. If I'd designed it, I would feel that way too. I look and admire chunky jewellery from a distance, as I find it's just not 'me' unfortunately. I have tried but it ends up looking completely 'blah'. Enjoy your weekend. We are expecting heavy rain here tomorrow! 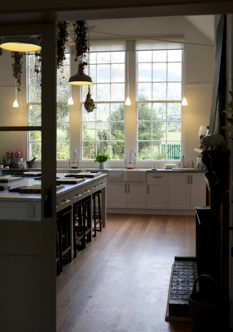 Thanks Tammy for the lovely mention on your blog. The jewelery that caught your eye is by a Hobart Designer Little Lari. I appreciate your professionalism when it comes to protecting makers designs.